Nanoscale AnalysisAtomic force microscopy is a very high resolution form of scanning probe microscopy. 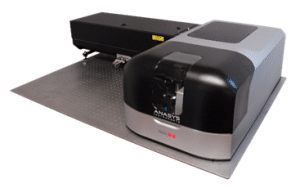 The atomic force microscope allows for the visualization and measurement of sample topography down to the nanometer scale. AFM can be combined with spectroscopy (FTIR), mechanical analysis (stiffness), and thermal (DSC) methods to provide chemistry and mechanical properties as a function of location on the sample with nanometer resolution.